Who could ask for more … at the Copa, Copacabana! But it’s not what you think. Bolivia has its very own Copacabana (Copa to the locals!) … it’s the main Bolivian town heading north towards the Peruvian border and the town that lies on the rim of Bolivia’s side of the infamous Lake Titicaca, the highest navigable lake in the world. Again, one of those places I had done before but was so happily about to do again! Lake Titicaca straddles the border between Bolivia and Peru in the Andes Mountains and at 3182 metres above sea level, it really does feel like you are on top of the world! It is said to be the highest navigable lake in the world. At 190 kilometres long by 80 kilometres wide there are spots whereby, once on the actual lake, it is so big that it appears to be like an ocean; you really can’t see the shore! It’s said to be the birthplace of the Incas, and with its many scattered ruins, it really does have that mystical feel about it. Chulumani … another hidden gem. On the road to Chulumani. The road to Chulumani was bumpy, very bumpy! But we were excited; a place I had not been to before and we had heard so many good things about it … primarily that it was not touristy. Let’s go! The four hour ride presented us with some spectacular views and scenery and although not the Death Road, there were still some bits where it was quite narrow and the sheer drops, quite literally, took our breath away. Out and about in Chulumani. Alex and Javier … “nos prestamos plata”. Upon our arrival, we could see that it was a quaint little place. Mostly indigenous folk, not that big, a Chulumani. Apart from the fact that the rooms were gorgeous and comfortable, the place surrounded by foliage and birds, and that it had a swimming pool and felt like a retreat … the owner absolutely made it! Javier, originally from La Paz, was beyond knowledgeable about the area and with his effervescent personality and desire to show and tell us what to do and see we had an absolute blast and ended up staying there for over a week. I loved the fact that until the last day we were the only gringos in the ‘hood! Days were spent exploring, yeh and sometimes even just relaxing by the poolside, and nights were spent deep in conversation with Javier who has since become a great friend … as he likes to say “nos prestamos plata” (“we now lend each other money”, which he says only happens between really good friends). Having lived in the States, he also has excellent English. Javier lives in this gorgeous place with his equally gorgeous daughter, Lupita, who besides going to high school, also helped out around the hostel. Lupita … bright, excellent English, smart and a conversationalist … we loved you! If only 1% of the worldwide teenage population could be like you. And to boot and excellent violinist! central plaza and lots of unpaved dusty roads. Had we just hit the Wild West? It instantly had that homely, ‘welcome home’ vibe about it. We asked around for accommodation (the places to stay can be counted on half a hand and struggling) and ended up at Country House. The way to chill out at Countryhouse Chulumani. A house with a (breathtaking!) view. We went on some great walks and saw some amazing things. The only foreigners around, the spotlight was often on us, but the people were really helpful and chatty. We chatted to lots of locals who were more than willing to tell their stories as well as invite us into their humble homes. There is no price one can place on this. We visited many little towns and one of my favourites was Chicaloma. This tiny place is home to many of Bolivia’s Afro-Bolivian population. The thing that really blew me away was to see some of the women dressed up in indigenous garb. I was used to seeing indigenous people in these clothes, not black people! Ocobaya was another tiny but pleasant spot as was Irupana, where we found organic coffee and people drying their coca leaves on the road. This is the way you dry your coca leaves. Being invited into the home of some locals. Alex showing Lupita how to make patacones. The real beauty and intrigue of the entire area was to simply ‘be’ … to walk, to breathe in the country air, to take in the spectacular scenery, to talk to the locals, to absorb the culture, and to spend some truly amazing time with Javier and Lupita. Lupita is a truly talented young lady and is part of the Chulumani Symphonic Orchestra, a group of young and talented musicians who gather weekly and practice. Despite the fact that the teacher comes all the way from La Paz weekly and that the local council has tried to make their existence difficult (I will not get into the politics here) they all continue to get together and play their instruments. Alex and I went to visit the group and chatted to them about the importance of believing in themselves and following their dreams. Dreams only come true when you believe in them! There is nothing quite like inspiring young people to be positive, to try and achieve their best and most of all push forward with vigour in the face of adversity. It was great to spend a couple of hours with them. This culminated in a ‘performance’ for us that simply blew us away! We were touched to tears! I hope that in years to come these kids will look back and think … we met two people who believed in us! Some kids from the orchestra. With the Chulumani Symphonic Orchestra. With the Chulumani Symphonic Orchestra; Lupita far left. And as so happens on our travels, it was time to leave and move on. This time, however, with a somewhat heavy heart. Javier, Lupita and Country House Chulumani had made an enormous impact on us. Would we see these people again? Yes, I think we will! Lots of hugs all around, tears in my eyes, and with a heart full of gratitude and joy we were off on our next adventure! As we walked away from the hostel, I looked back at the waving Javier and Lupita and, with teras in my eyes, blew them kisses. This is why I travel … THIS is why I travel! With Javier, Lupita and Vaughn (the only other tourist we saw in the week). I will miss you Javier! Dedication: To our ‘charming gardeners’. Javier and Lupita’ you are the charming gardeners who allowed our souls to blossom. You made us happy and you became our friends! We will never forget you both and this spectacular part of our journey. Friends forever! You are always welcome to visit us and stay with us in Australia. When our journey is done and dusted, it is people like you that leave a footprint on our hearts. Those footprints will always remain! We thank you profoundly! Dedicatoria: A nuestros ‘jardineros encantadores’. Javier y Lupita ustedes son los jardineros encantadores que permitieron que nuestras almas florezcan. Nos hiciste feliz y se convirtieron en nuestros amigos! Nunca olvidaremos a los dos y esta parte espectacular de nuestro viaje. Amigos para siempre! Siempre estarán bienvenidos visitarnos y quedarse con nosotros en Australia. Cuando el viaje esta terminado es la gente como usted que dejan una huella en nuestros corazones. Estas huellas permaneceran siempre! Te agradecemos profundamente! Next: Copacabana and Lake Titicaca. A local on her walk. Everyone deserves some rest time. Beauty … and no beast in sight! Yin and Yang … cultivation coca leaf style. The colours of Mother Nature. The Countryhouse dogs saying goodbye as we leave. Up and down in La Paz! 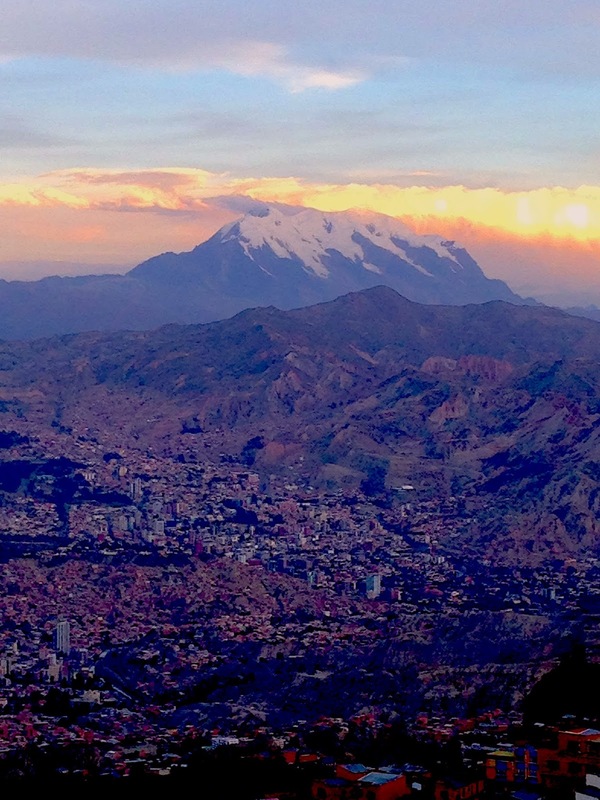 Oh La Paz … you’re high, you’re cold, you make walking around difficult, you have witches’ markets, good coffee, indigenous women wrestling, amazing museums, spectacular scenery and amazing markets! I could finish the blog here really! Oh you do do delight, and the best part about you is really that you are just you and that simply walking around you is a delight! Nuestra Senora de la Paz (Our Lady of Peace), or La Paz, as it’s more commonly known sits in a bowl surrounded by the high mountains of the altiplano and sits in elevations of between 3200 and 4100 metres above sea level. Although very cold at night, it’s not uncommon to be walking around in a t-shirt and pants during the day whilst looking out to the triple-peaked Illamani in the distance; always snow-covered and it can be seen from many parts of the city. Arthy’s Guesthouse. Despite being on a very busy road, what lay behind the bright orange door which was its entrance was a veritable clean, cosy and tranquil oasis. The owners were helpful and treated us like their family. The kitchen was a winner. I am not going to lie, I have not been overly impressed with Bolivia’s mostly fried-fare but the markets have some of the greatest variety I have seen anywhere in the world. La Paz has grown and expanded over the years, and most certainly since I was here in 1999. El Alto used to be the ‘slum-city’ that sat five kilometres away on the outskirts of La Paz. The urban sprawl has grown so much that this once suburb of La Paz is now really just part of it. It’s one of Bolivia’s largest and fastest-growing urban centres. It’s also the highest point of La Paz at a little over 4100 metres above sea level. The views from El Alto are breathtaking, needless to say! It has a very interesting history and past; populated largely by Aymara (Bolivia’s two biggest indigenous groups are the Aymara and Quechua) migrants from the surrounding Altiplano it was officially recognised as a separate municipality from La Paz in 1986. It instantly became the fourth biggest, poorest and fastest growing city in Bolivia. Along with this were included all the problems of a poor city that grows that fast! It actually has a bigger population than La Paz! Aerial transport, La Paz style. La Paz has done something brilliantly. It has created Mi Teleferico (My Cable Car), not as a tourist attraction but as an aerial cable car urban transit system. It was actually planned in order to address a number of problems, the most prominent being a precarious public transport system that simply could not cope with user demands. Built by an Austrian company, and opened only last year in 2014, there are currently three lines in operation and six more are in the planning stage. The first two lines, the Red and Yellow, connect La Paz with El Alto and blow-your-socks-off views are afforded. As it’s not a tourist attraction (yet!) and a means of public transport, we had lots of fun using the various lines several times. It was not just the views that blew our socks off but also the sheer size of La Paz which continues to grow like it’s on top-end baby formula! El Alto Market … something for everyone! Needless to say the cable car is how we got to El Alto’s famous Sunday market. Market? It was a ‘suburb’ of street to street vendors selling everything from llama foetuses to top-end Bose sound systems. You name it, they have it! It was absolutely chockers and it just went on and on and on and on. These once-poor-people have carved themselves out a decent income and good on them. It reached a point where it was just too hard to take it all in. Without a doubt one of the biggest markets I have ever seen … and with a brilliant view of la Paz to boot! With its dusty streets and sweeping views, it looks like something out of a wild, wild west movie! Keep in mind that it’s the world’s most active ‘rebel’ city and the scene of frequent protests and crippling strikes! El Alto is also home to La Paz’s Lucha Libre or ‘Cholitas Wrestling‘ as it’s more commonly known and I can highly recommend it. Much more than entertainment and profits however, Cholita wrestling is a way for Bolivian women to prove their worth in a ‘man’s world’. Having been abused, humiliated and discriminated against throughout history, the ring is one place where indigenous women can hold their head high, do their job with pride and be on equal footing with men! You go girrrrrrls!!!!!!! La Paz, you were so much more than spectacular scenery, markets and dizzying heights! Every nook and cranny was packed with culture, information and protests! The Mercado de Hecheria, or Witches’ Market, sells everything from herbal and folk remedies to toucan beaks! Interesting to walk around and watch the vendors doing rituals for everything from the purchase of a new house to getting rid of unwanted negative energy. Or perhaps a potion of some description? Plazas, churches, museums … La Paz abounds in all. One of my absolute favourites, however, was the Museum of Musical Instruments. This place has an exhaustive hands-on collection of unique musical instruments, including those that are specifically Andean. It’s a must see for musicians and we lay-people alike. A private museum, it was founded in 1962 by famous Bolivian ‘charanguista’ and the inventor of many musical instruments, Ernesto Cavour. Every Saturday night the museum holds a concert, showcasing some of La Paz’s and often Bolivia’s most seasoned musicians. The concert room is very small and the entry fee is around USD$3.50. Anywhere else in the world this type of talent would cost a fortune! Underrated, understated! What a collection of instruments. We were fortunate in that the night we visited, we saw the master himself! What a truly talented man. His speciality, clearly, is the charango, a small Andean stringed instrument. Along with a couple of other artists, including Franz Valverde who played the muyu-muyu (like a guitar with strings on both sides!) and Rolando Encinas on the pan pipes, we were totally entertained over a couple of hours. The museum also happens to be on Calle Jaen, La Paz’s finest colonial street; cobblestoned and free of traffic, it’s like an oasis of tranquility in a chaotic city! Of course we visited many markets and parks, but we also took some time to hang out and simply take in the La Paz life. I have seen lots of changes in the 15 years since I was here last. Without a doubt there is still a lot of poverty, bit this seems a world away from suburbs like Sopocachi which abounds in lovely restaurants and funky cafes. Central Park .. a view ‘above’ the rest … La Paz. La Paz has been described as chaotic, frenetic, dirty and dangerous, but we loved it! It charged our batteries and with a renewed zest, we were ready to move on. Coroico is usually the next stop on the tourist trail, which is what I did in 1999, but I had heard that it had become super-touristy. La Carretera de las Yungas, the road between La Paz and Coroico, is known as the most dangerous road in the world. I know! I did it! 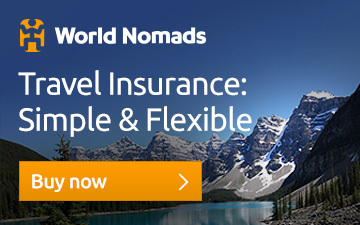 “It’s estimated that 200 to 300 people travelling on it die each year. the thin road climbs jungle-clad mountains to a height of 4650 metres, winding and turning all the while with nauseatingly deep canyons below. Dozens of vehicles went off the road each year, and with vertical drops of up to 1000 metres over the edge , annual fatalities reached into the 100s”. No thanks, been there done that. These days, it’s mostly used by cyclists on Death Road cycle tours. Fortunately, there is an alternative road to Coroico … some use it, some don’t. I played Russian roulette on this road once and I was not going to do it again! Some things in life are to be repeated and some just are not! Soooooooo, we looked at the map … and chose Chulumani close by … it would prove to be one of the best choices we made, and a South American highlight! Next: Chulumani and Lake Titicaca. Cars, buildings and protests, La Paz. Out and about in La Paz. Artists draw it as it is! Or was! It’s a hot air balloon? No, it’s a cable car! La Paz … houses everywhere! Cable cars run over the top of the entire city. Evo … patria o ratria? La Paz just keeps growing! Everything’s up for grabs at the El Alto market. With our Swedish friends Sara and Mark at Arthy’s Guesthouse. The La Paz shoe shine ninjas! Saying goodbye to Reuben at Arthy’s. View of La Paz at the top of the cable car line. On the way back from Toro Toro National Park we decided to stop in Cochabamba for a few days, seeing that we had to pass through it on the way to La Paz anyway. Besides, we had been told that it was Bolivia’s food capital! Sold! Synchronicity! How I love it! We had only just arrived and found ourselves in the central plaza discussing potential places to stay, when we were greeted by Raquel. We had recently met Raquel and her husband in Samaipata. Lovely people, Raquel is a batik artist and Roy Querejazu Lewis is a university professor and Andean rock art specialist. Raquel invited us over for lunch the following day. After lots of walking and checking of places (I am very fussy, I know!) we finally ended up at Hostal Colonial. The owners were never going to win the hospitality award, but it was a quiet, safe and comfortable place, which would serve us well for a few days. Good eating, relaxing and reading. A few years ago my wonderful friend, Linda Drew, gave me Eduardo Galeano’s The Open Veins of Latin America to read. A book which analyses Latin America as a whole, I believe it’s a must read for all Latinos and indeed anyone who is passionate about Latin America and its history. So, I bought the book in Spanish and thought I’d give it a crack! Amazing reading! The next few days were really just about chilling out, eating good food, drinking good coffee (Bolivia has really impressed us! ), partaking in one of my favourite pastimes (visiting markets, of course) and simply taking in the city sights. We visited the Cristo de la Concordia, which effectively looks like Christ the Redeemer in Rio de Janeiro. We caught a cable car to the top of Cerro (hill) de San Pedro, where the statue sits atop of and were offered sweeping views of Cochabamba and its surrounds. And here’s a bit of information; both statues are 33 metres tall because Christ supposedly died when he was 33 years old. After some chill in’ at the top, we took our time walking down. It’s a good life at the top! More sweeping views from the top. Meanwhile, back at the bottom, we did some exploring of the city! Looking up to Cristo de la Concordia. Cochabamba’s central plaza by night. Street art; what some had to say about the church! Gorgeous little boy, sadly begging! With Roy, Raquel and Mariel. Mariel. We had a wonderful time chatting about a multitude of things from politics to the many books Roy has written on rock art. He has even published a book on Bolivian flora. He gifted us two books and signed them both. These are the magical travellers minties moments! Alex and Roy having a beer. Roy’s work in an Australian Rock Art journal. The girls; Raquel, Mariel and I. After a few truly wonderful days, it was time to move on. La Paz awaited us! I wondered how much it would have really changed since my last time here in 1999? But then I suppose a lot has changed since then! Last time I was in Bolivia I was only weeks away from meeting my soul mate and the love of my life in Ecuador. We have now forged a brilliant life together and are exploring the continent of his birthplace together. Ain’t life grand! Next: La Paz you did not fail to impress! Always ready to take a good shot! A room with a view, cable car to the Christ. One of Cochabamba’s many plazas. Not everybody is having fun! Dedication: To Raquel and Roy. Meeting people like you is what makes our trip truly special! Thanks for offering us your friendship and an insight to your country that no guidebook could ever do. Dedicación: Para Raquel y Roy. Encontrar gente como ustedes es lo que hace que nuestro viaje sea verdaderamente especial. Gracias por brindarnos su amistad y darnos una mirada adentro de su país que ninguna guía de viajes te pudiese haber dado. Where the dinosaurs walked more than 120 million years ago! In the streets of Toro Toro. An overnight bus took us to Cochabamba, in central Bolivia, from where our plan was to go to Toro Toro National Park, ‘relatively’ close by. As can sometimes be the case in South America, we were sent to the wrong place, and had to back track in order to get to the right point. Oh well, at least we got to see some of Cochabamba along the way. Toro Toro National Park is only 135 kilometres southeast of Cochabamba and its drawcard is its dinosaur tracks, spectacular geological formations, caves, hikes and ruins. We had met some travellers along the way who had told us that it’s a Bolivian must-see, highlight and hidden gem as well as not being touristy. SOLD! We were also told that it’s only accessible by bumpy gravel roads and riverbeds, which takes seven hours in the dry season and much longer in the rainy season when sometimes the road becomes totally impassable. Information on this place is scarce, as for many off-the-beaten-track places in South America, but we determined to do it! That’s a pretty big foot print! We finally did get to the ‘place’ where small pick-ups take you to Toro Toro … when full! OK, so we had to wait a couple of hours, or three! Patience! All good things take time, or so they say. After making friends with a gorgeous French-Canadian lady called Audrey and her lovely partner and child, we were off. The road was bumpy (more like a dirt track … OK gravel road!) and it took around five hours to cover approximately 140 kilometres. The town is tiny, barely a central plaza and a few surrounding streets. We searched for a place to sleep and found a basic, but clean place on the ‘main drag’, run by the delightful Maritza and her two year old Santiago. What the place did not have in mod-cons it made up for by the warmth of its host. Toro Toro … serene, tranquil, breathtaking! Toro Toro National park protects a remote and sparsely inhabited stretch of the arid Bolivian Andes. It is the country’s smallest national park but with a huge wow factor! What it lacks in size it makes up for with its powerful scenery and varied attractions. The park encompasses everything from hanging valleys to eroded canyons, ringed by low mountains whose twisted geological formations are strewn with fossils, dinosaur footprints and labyrinth limestone cave complexes. We spent a couple of days doing some day trips exploring the area and were well and truly blown away. The main attractions and indeed highlights are the limestone Umajallanta Caves and the waterfall-filled Torotoro Canyon. Umajallanta Caves … not for the fainthearted. The caves most certainly were not for the faint-hearted. I was half-expecting an easy-going guided tour, but this was all about crawling on your hands and knees and doing in Bear Grylls style. After more than two hours I emerged a little shaky but truly blown away by the grandeur of what I had seen. In comparison, despite the dizzying height, the canyon was far more sedate and the Vergel waterfall and surrounds nothing short of spectacular … and a lovely spot for a swim, might I add. Umajallanta Caves …window to another world. On top of the world … City of Itas. We also visited the City of Itas, 21 kilometres out of the town centre. At 3800 metres above sea level it is an area of majestic and huge rock formations which really does look like a city made of stone. Huge caverns with arches that look like baroque churches have been carved out by Mother Nature, but in parts there is evidence of ‘human tampering’ in the form of rock art. It was a drizzly day when we visited and so the overall feeling was simply one of majesty and grandeur. Without a doubt, this entire area has been a South American highlight. Still virtually unknown on the gringo-tourist-trail, I reckon this is the time to be here. This has been without a doubt, a major highlight of our trip. Laid-back and lazy with very few ‘tourist mod-cons’ yet a veritable geological wonderland. When the tourists get a grip of this I am sure it will provide Machu Picchu with some decent rivalry! Bye, bye Santi … off to our next destination! The town with a splendiferous back drop. We did it! Umajallanta Caves. This is the way we wash the clothes. On our way to Toro Toro Canyon. Coming down … to tropical Bolivia! We were umming and ahhing about where to go to next. I had done much of the Andean side of Bolivia all those years ago and wanted to also see some things that I had not seen before. A tip off on Samaipata; sub-tropical climate, not that far from Sucre and set in the stunning wilderness in the foothills of the Cordillera Oriental (parallel mountain range to the Bolivian Andes). And at 1650 metres above sea level. I repeat 1650 metres above sea level!!! That may not seem like a big deal, but considering that we had spent the last several weeks in very high altitude (equals cold and hard to breathe) this was a more than appealing option. Next destination SOLD! Buses being buses in Bolivia, we arrived at our destination at 4am. Luckily it was a small and safe enough place for us to hang around in until dawn broke and the hour was reasonable enough for us to go and look for some accommodation. We finally settled on La Posada del Sol. We only stayed a night as we felt that it was overpriced for what it offered. A gringo(foreigner)/local partnership, perhaps they had gotten a little too comfortable and forgotten about what really mattered. You couldn’t do this and you couldn’t do that; it was totally geared at money, money. And don’t, I repeat don’t do your own laundry! Having said that, we did meet a wonderful couple at the cafe there; Roy and Raquel from Cochabamba. Roy was a professor and specialist in Andean rock art and Raquel a batik artist. Really lovely people whom we spent hours chatting to. We ended up spending the next few days at the friendly, family-run Residencial Kim. Basic and clean rooms with a lovely courtyard and kitchen (always a deal-clincher for me) with lovely and helpful staff. Fresh fruit at Residencial Kim. The place to see in Samaipata is the mystical pre-Inca site of El Fuerte, or the Fort. Just an uphill from the village but most easily accessed by public transport. We had also made some new English friends at La Posada, so we decided to go along together. With Cat and John on the way to El Fuerte. Declared a UNESCO World Heritage Site in December 1998, it is not actually a military fortification, but is generally considered a Pre–Columbian religious site built by the Chane people, a pre-Inca culture of Arawak origin. The sculptured rock is known as one of the most impressive examples of rock art in the world. Extremely well kept it took us a couple of hours to walk around and take it all in. Next stop, a couple of days in tropical Santa Cruz. Many years back we met a Bolivian/ English couple in Melbourne, who now live back in England (love to you both Raquel and Bodhi); Raquel’s family hail from Santa Cruz. We told Raquel we’d go visit them, but she insisted that we go stay. All I can say is that her parents, Emma and Angel, have got to be two of the most hospitable people I have ever met, and that goes for all of Raquel’s family, who simply could not do enough for us in the few days that we were there. Angel went out of his way to cook for us, and various family members to show us around. And the mangoes from the tree in the backyard … OMG! These are the ‘travelling magic moments’! Climate wise, what a difference from the Bolivia we had seen thus far, it was both hot and humid. And so we spent the next few days just hanging out with the family; a relaxing difference from the usual sight to sight that we have been doing over the last few months. Plaza 24 de Septiembre by night, with the cathedral in the background. With Raquel’s mum Emma, sister Lorena and little niece Mishell. Thanks for cooking for us Master Chef Angel. Showing us around Santa Cruz. A day trip to Porongo with the family. Yucca pancakes (tortillas) in Pongo. Alex getting ready to eat sonsos, made of yucca. Saying goodbye to the family. With the emblem of Bolivia, painted by Angel. At the Santa Cruz bus terminal … baby it’s hot inside! And so another adventure had come to an end. To see and experience new and different things is great, but it’s really the people that you meet that make that experience extra special. With a smile on our faces, off we went to our next destination. Cochabamba and Toro Toro here we come. Next: National Park Toro Toro (one of Bolivia’s hidden secrets) and Cochabamba. Dedication: To the wonderful, wonderful Burgos family who let us into their home and treated us like their family. You went out of your way to feed us and show us as much as you could in the few days that we were in Santa Cruz. We want you to know how much we appreciate your kind, warm and loving gestures. You will always occupy a very special place in our hearts. Angel and Emma your family should be honoured to have you! Dedicacion: Para la linda, linda familia Burgos, que nos permitieron entrar su hogar nos trataron como su propia familia. Hicieron de todo , darnos de comer y mostrarnos la ciudad y alrededor en los pocos días que pasamos en Santa Cruz. Queremos que sepan que apreciamos muchísimo sus buenos, calurosos y amorosos gestos. Siempre ocuparan un lugar muy especial en nuestros corazones. Angel y Emma su familia deben estar honrados de tenerlos en sus vidas.